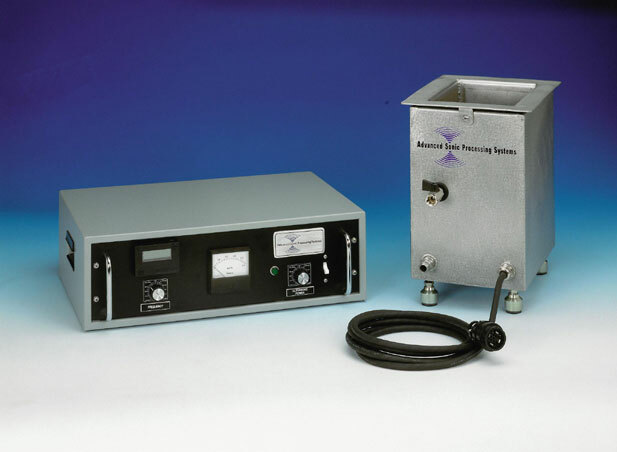 Our Sonochemical Reaction Vessels are temperature controlled, high-powered ultrasonic tanks ideal for Sonochemical Reaction Investigations. The system is effective for producing sonochemical reactions, extractions, organometallic synthesis, deagglomeration and accelerating processes with sluggish liquid/solid interface dynamics. The SRV-54 is a very active, 1 gallon system with process temperature control capabilities. The SRV is driven by a 600 Watt magnetostrictive transducer ar 20 kHz rated for continuous duty, (100% duty cycle). The SRV's internal cooling manifold maintains constant temperature operation of the reaction vessel, (process solution). The steady state operating temperature range for the SRV is -10° C to 120° C, (400°C optional). The Sonochemical Reaction Vessel is a high-powered ultrasonic tank effective for producing sonochemical reactions. The SRV can be filled with either your process solution or a coupling fluid. Different process solutions may be used to optimize ultrasonically enhanced: extractions, organometallic synthesis, deagglomeration and processes with sluggish liquid/solid interface dynamics. The process solution may even be a detergent for cleaning your glassware or other soil removal applications. The SRV open top design allows the researcher to insert specialized reaction cells directly into the acoustically energized solution. A coupling fluid transmits the acoustic energy within the tank to the immersed reaction cell. Laboratory glassware or beakers are effective in isolating the ultrasonically processed sample from the coupling fluid. This technique reduces the sample size required for each experiment when conducting broad scope investigations. The SRV-140-HP-TC is a 7 gallon (27 liter) ultrasonic system with 2,000 Watts of power. 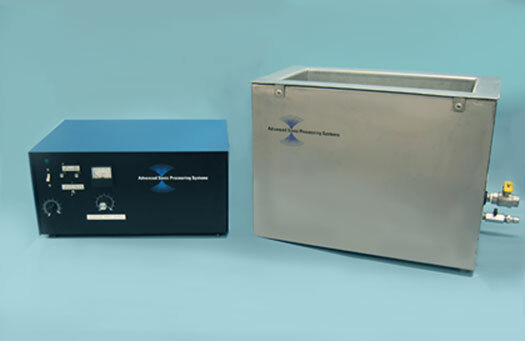 This system is ideal for processing samples within a 2 liter beaker (Vessel Internal Dimensions: 11.8" x 11.8" x 14" deep, 30 cm x 30 cm x 35.5 cm deep). The Sonochemical Reaction Vessel, SRV-160 is our 5 gallon, 2,000 Watt Reactor. This system has the Adjustable Power Control Generator fitted with Sweep Frequency Operation and Ultrasonic Pulsed Operation.